Set the oven to 160°C/320°F/Gas Mark 3. Put the duck pieces into a roasting tin. Sprinkle them with five spice and salt, add the star anise, orange parings and juice, wine or sherry, and stock. Cover with foil and cook for 2 hrs until tender. Take the foil off the duck. Turn the oven up to 200°C/400°F/Gas Mark 6 and cook for another 20 mins to crisp the skin on the duck (or put it under the grill). Leave to rest for 10 mins, then shred the meat off the bone. 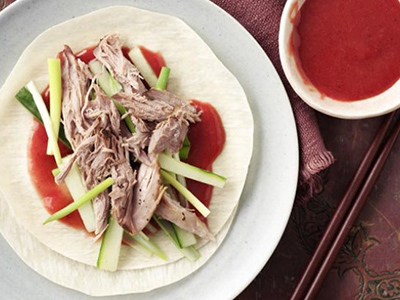 Serve with hot pancakes, spring onion and cucumber strips and the plum sauce. To freeze: Put the duck portions and juices in a strong polybag. Put the sauce in a small container. Seal, label and freeze. Use within 1 month. To serve from freezer thaw the duck and sauce overnight. Put the duck and juices in the oven at 200°C/400°F/Gas Mark 6 to reheat and crisp for about 30 mins. Warm the sauce, if you like.